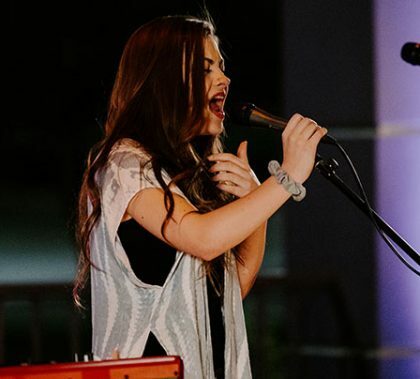 Monday night marked the final Canyon Worship Songwriters Showcase for Katie Brown and Harrison Russell, and the two stars of the Worship Arts program went out with a crescendo — they performed side by side for two songs. The way one of those songs came together is an interesting story, and so are their thoughts about their experiences in the program and where it’s headed. 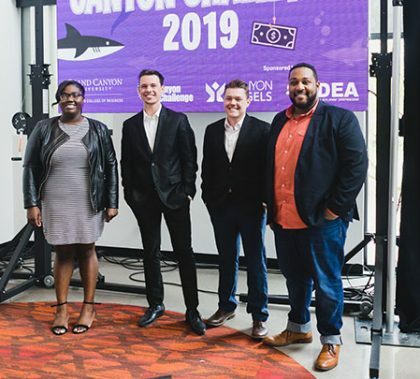 GCU alumni Felipe Reyes, Dylan Santos and Kevin Llamas created FADES, an app designed to make getting a haircut easier. 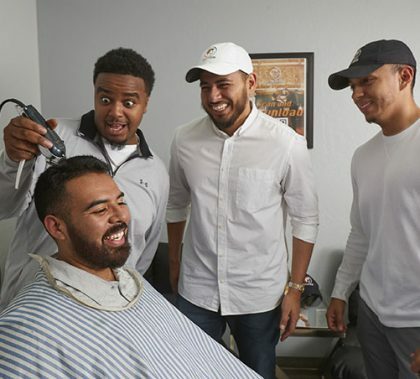 Their ultimate goal is to link customers with mobile barbers. “It’s going to take some time (to educate people to use the app and to go mobile), but people weren’t doing taxes on their phone not too long ago, either,” Reyes said. Photos by David Kadlubowski GCU News Bureau GCU celebrated homecoming Saturday with a wide array of activities, including an alumni golf tournament, Breakfast with Thunder, the GCU Hall of Fame inductions, the tailgate and derby kart races, and the crowning of the homecoming king and queen during the basketball game. 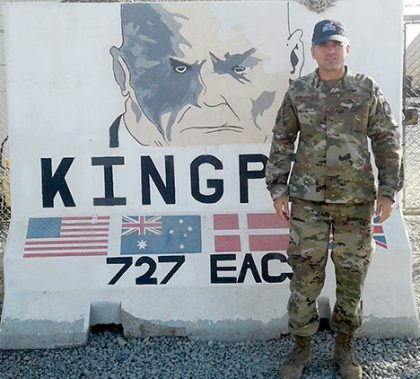 Mark Rosewaren won’t be on campus for homecoming Saturday, but he’ll be there in spirit — even though he’s on Air Force duty in Afghanistan. 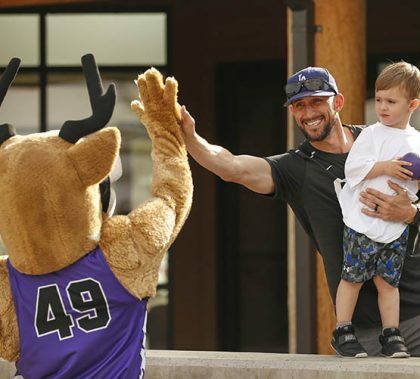 But what makes his story interesting is his reaction after receiving some serious GCU swag. 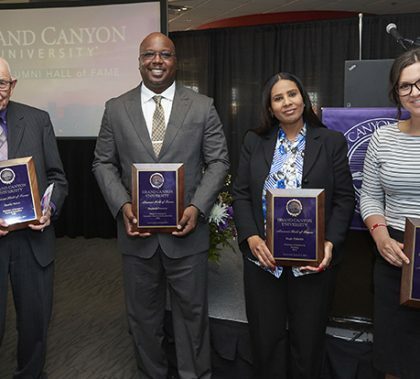 Hagir Elsheikh, one of five inductees into the GCU Hall of Fame on Saturday, is a domestic violence activist and TV and radio talk show host in Pennsylvania and has founded a staffing agency and a nonprofit that helps victims of violence. 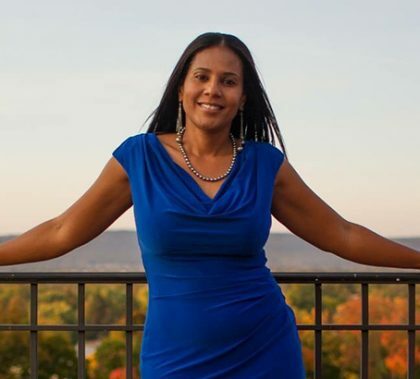 But long before she accomplished any of that, she had to flee the political violence in Sudan and survive domestic violence in her own life. She was an online nursing student before getting her degree in 2012, and she visit campus for the first time Saturday. Kara Morrow is the first GCU Honors College student to be selected for a White House internship. The 2018 graduate is surrounded by exceptional students. 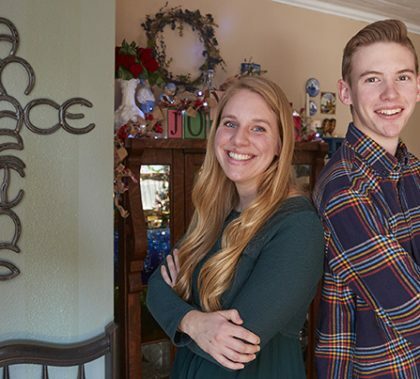 Her sister, Kelsey, is a 2015 GCU graduate slated to complete chiropractor school in May, and her brother, Kaleb, a GCU freshman, is a National Merit Finalist and an aspiring forensic scientist. 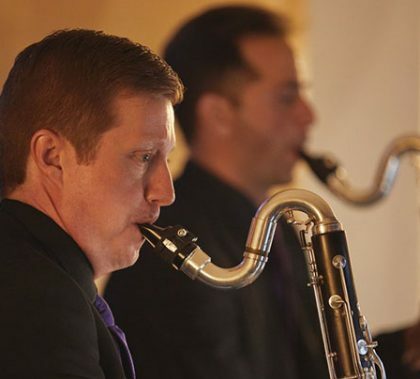 Just a day after GCU’s music faculty hosts the All-Regional Honor Band Audition Workshop, they’ll be nestled in the University’s Recording Studio on Tuesday night for the faculty recital, “Duets.” Adjunct clarinet professor Tim Haas will perform duets with flutist Dr. Jenna Daum, oboe instructor Dr. Rachel Messing, tuba player Kevin Bock, guitarist Dr. Jonathan Crissman and alto saxophone player Dr. Scott Zimmer. Also performing will be GCU alumna Grace Baughman. “We have some major faculty here. 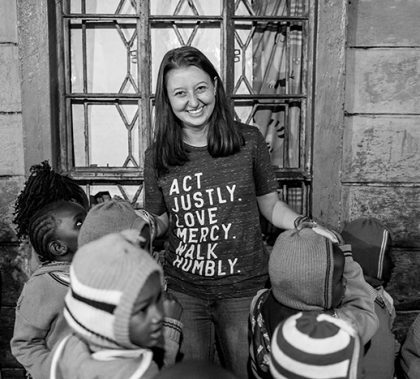 I always love collaborating with the faculty because they’re so good,” said Haas of the concert, which starts at 7:30 p.m.
Allison Fassinger wanted to help people, but she wasn’t exactly sure how — until the GCU alumna took a trip to Kenya. It’s where she now lives and works, helping Kenya’s children at Naomi’s Village.